Viewing photos of our resort online is easy! You can view amenities photos and so much more at one easy glance. Our Frequently Asked Questions page is here to help! 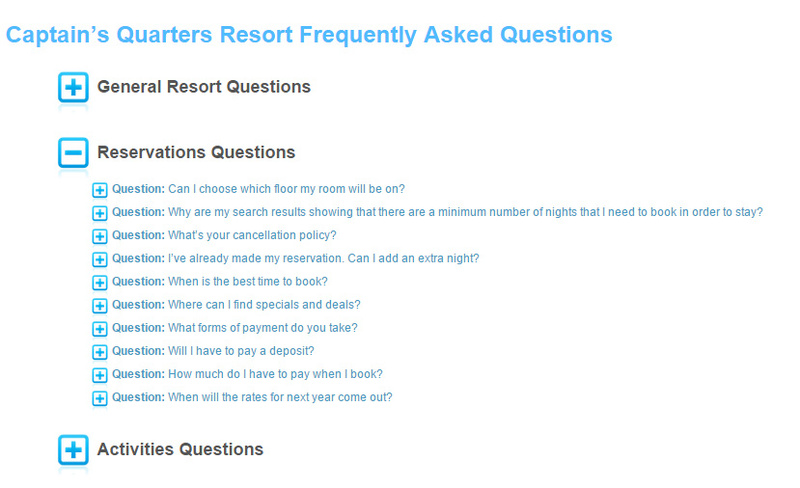 Chances are many of the questions you may have about our oceanfront resort can be answered here. You can always contact us as well if you have any questions you’d like to ask. We are here to help! Did you know that you can take virtual tours of our property? We have a variety of tours including specific rooms as well as our amenities and pools. It’s super easy to check out our Myrtle Beach resort before you arrive! We list both Myrtle Beach events as well as our own seasonal Captain’s Quarters Resort events right on our website, making it easy to see what’s going on during your vacation that you may want to attend. We have an array of information about things to do in Myrtle Beach on our website including shows, shopping and dining. You can learn about Myrtle Beach without even leaving our website! If you aren’t sure what Myrtle Beach accommodation type to book, you can easily browse our array of rooms on our accommodations page. We make it easy to find what’s right for your family vacation at Captain’s Quarters Resort! Did you know that we list a wide range of specials and packages on our website? This is a great place to check before you book your family vacation to see if any specials are good for when you are visiting. It can help you save a lot of money! If you are reading this, you have found our blog section so we encourage you to stick around and read more to help you plan your Myrtle Beach vacation. What Captain’s Quarters Resort Room Type Is Best for My Family? Want to become part of the conversation before, during and after your trip? We love to hear from our guests on our Facebook page! Here you can ask questions, browse photos, view videos and so much more. It’s a great place to hang out so be sure to stop by and say hi! We hope that all of these web pages help you with planning your next Myrtle Beach vacation! Be sure to bookmark this page so you can easily navigate to all of our helpful pages when planning your stay!